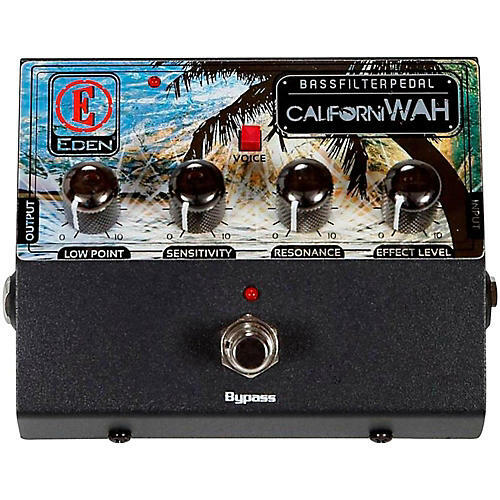 The CALIFORNIWAH is a pro-level bass filter pedal that provides the expression you need to stand out in the crowd. Designed specifically for bass players, the CALIFORNIWAH pedal provides the flexibility to adjust filter frequency levels and delicately tailor the sensitivity of the effect so you can choose exactly how much expression you get and when. LOW CONTROL: Adjust how high or low the filter is set. Just like a manual filter (wah) this control allows you to decide where you want to start to filter your sound. SENSITIVITY: Control when the effect is activated. Set to your instrument level and playing style. RESONANCE: Dial to the left to filter out lows to provide a top end vintage voice or dial to the right to fill out the lows and mids. VOICE SWITCH: The Californiwah has two voicing modes that provide two different filter voices. EFFECT LEVEL: Controls the overall level of the pedal to balance the effected and no-effected sound. Controls for LOW POINT, SENSITIVITY, RESONANCE and EFFECT LEVEL.